My colleagues at Awoko say there are about 100 newspapers in Freetown, and they’re proud to work for the best. They say this is self evident — just compare how Awoko and the other newspapers in the country cover the same stories. Awoko is totally independent, so it differs from the papers that favor a political party, or the Sierra Leone Daily Mail, which is government run. 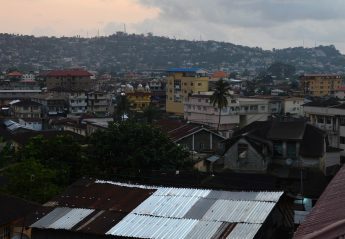 The Awoko office is located in the city center of Freetown, opposite a Christian school. On the same street are several of the makeshift, shack-like dwellings with tin roofs that are ubiquitous in Freetown. From the balcony of the Awoko office you can see the bustle of the street, and the nearby electrical utility building marred by black scorch marks from a fire. Anyway, I started my first day at Awoko on July 7. The newsroom has at least 10 editorial staff members (and I’m probably forgetting someone), along with many more supporting staffers. They work in a second-floor room outfitted with several computers and printers, a TV and some big desks. There are always copies of some of Awoko’s many competitors lying around. Editor in chief Kelvin Lewis is also the president of the Sierra Leone Association of Journalists. He introduced me to the Awoko staff members with a deadpan joke about each of them. I’ve been coming in to the office for less than a week now, bus it’s usually a similar routine every day. Several staff members meet just before 9 am to look over mock-ups of the next day’s paper for any mistakes or things to change — these are first drafts of the paper to be officially circulated the next day. Then, I usually go with one of the reporters on an assignment. So far I’ve been to three press conferences, including one at the state house, and to a murder trial. More on all of those in another post. This is not a nine-to-five office, and I’m not sure whether or not that’s normal for Sierra Leone. But people continue working in the office well past 7 pm, and sometimes later. I’m the 7th intern from the University of Washington that Awoko has had — the partnership started in 2007, I believe, and has had one or two years missed (most notably 2015, when the university wouldn’t send anyone for fear of ebola). The staff are just awesome — they’re serious about their craft, and they’ve been incredibly welcoming, friendly, helpful and accommodating of my silly questions. They’re always quick with a joke or quip. And I’m happy to say I’ve been assigned serious, real work right away — the staff assume I’m up to the task, and expect nothing less, which is perfect. I’m looking forward to the next nine weeks! Today’s issue of Awoko (top) and yesterday’s (bottom), though it’s actually more like “tomorrow’s” and today’s. Each contains one of my columns, and the bottom headline is for a story I wrote, covering a press conference at the state house. As I type this I’m at the YMCA Hostel in Freetown, Sierra Leone, lying on a bed with a mosquito net hanging ominously over me. There are two other empty beds in the room, also fitted with mosquito nets, but I’m the only guest here. It’s not that I’m not glad the nets are there – it’s just, they have the ironic effect of somewhat shattering my peace of mind. They’re a reminder that even though I feel calm and relaxed being here – more so than I thought I would – it’s not a part of the world that calls for getting complacent about disease. Waiting for the boat, we were treated to a beautiful sunset over the water. It was a great introduction to Sierra Leone. But as with most international flights, you can already start to get a sense of the country you’re flying to just by looking around at the airport terminal before the final leg of the journey. In Paris’s Charles de Gaul airport departures hall, its domed wooden roof making it seem like the inside of a tunnel, there were people of all nationalities gathering at the gate for my flight – but most of them must have been Sierra Leonean. Many of the women wore hijabs, in red, sunflower yellow, pink and white. Other women wore different head coverings or none at all, and either colorful and floral clothing or Western dress. And a surprising number of men were wearing suits, jackets and fedoras. I slept through the descent over the Sahara and into tropical Africa — it mostly was clouds through the airplane window but I caught views of Sierra Leone from above as we were landing. The countryside was all green, darker trees alternating with lighter grass and vegetation, chiseled through by rivers, streams and lakes. There were occasional interruptions in the form or villages or houses. I was amazed to see one small village linked to another by a single brown road, both otherwise totally surrounded by green forest. On the ground, the air felt sticky and warm. I picked up my bag from the small departures hall and met with someone from Awoko newspaper, who my editor had kindly sent to make sure I got to the city okay. He enlisted the help of an airport security guy. Trailing behind him, it seemed I was able to glide smoothly through the rest of the airport, including customs, and touts wanting to point me to transportation options. Stepping outside, I heard the Muslim call to prayer. The roads were mostly a red-brown dirt, with some potholes that had filled with rainwater to look like pools of paint. Just in view were simple houses with tin roofs. I changed a few hundred Euros outside the airport with a man the airport worker pointed me to, and he gave me back a stack of leones, the local currency. It was interesting to hear people talk in Krio, the local language in Sierra Leone, because a lot of it is understandable. The airport guy asking, “How much did he change for?” for example, was pretty similar to the English. Sierra Leone’s airport is not surrounded by city. The shuttle bus quickly took us on a dirt road past more tin-roof houses surrounded by palm trees. As we rode past, I saw a young girl pouring water from a can. Nearing the beach, the smell of wood smoke and cooking fish wafted from the houses. It seemed these were just regular houses where people lived. I didn’t get a good view of anything through the boat windows as we crossed the harbor — it was too dark. Inside, the soundtrack started with Bob Marley and went on to the Titanic theme, which seemed fitting travelling in a boat that bobbed up and down quite this much. At the boat terminal on the other side, I waited for my ride near a bar while young men listened to the TV and played what looked like checkers on a large board. On one side of me, little stray dogs played, slept, yapped at each other and periodically came over looking for food on top of a building that was either demolished or under construction. Eventually I met up with Michelle, who works at the Awoko newspaper handling logistics, and Cooper Inveen, who did the same internship through UW that I’ll be doing, and is now a freelance journalist in Sierra Leone reporting for Vice, Al Jazeera and The Guardian. After we dropped off Cooper at his house to get some sleep before a reporting trip, Michelle took me to the Awoko office to meet with editor Kelvin Lewis. On the way, we listened to the radio – heavily Auto-Tuned songs in what sounded like Krio. It was too dark to see a whole lot of the city, but I couldn’t miss the colorful signs and advertisements, corner shops, and bustling activity. I talked some logistics with Mr. Lewis, and then went to my hostel for the night.